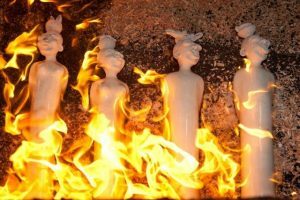 ‘The art of expression’ is what inspired ceramic artist Trayci Tompkins to design and create a range of Raku-fired ruler high clay sculptures for her then once a week employee Tim Dlamini. For this quiet, deep-thinking young man from the local rural community, it was a perfect match. He quickly learnt the art of clay sculpture. 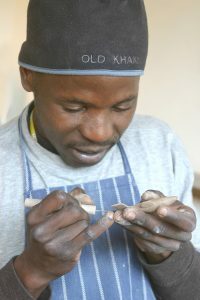 Tim works from his home studio in Sweetwaters, near Pietermaritzburg, and hand-models hollow clay balls into expressive little faces and quirky sculpture headpiece or ‘thoughts’. No two are ever the same. This simple, heartfelt little clay figurine has become quite iconic today, and has resulted in full time employment for Dlamini and his friend Tim Buthelezi. The Dlamini’s success is largely thanks to the commitment and tenacity of Stuart Tompkins – who walked away from a director role in the corporate world in order to build The Dlamini brand. Stuart balances his time between selling, packing and dispatching Dlamini’s. He’s often found head first in the smokey surrounds of his Dlamini production. Firing Dlamini’s is not for the faint-hearted but Stuart has it down to a fine art. After an initial firing to strengthen the clay, The Dlamini’s are covered in specially-formulated colour glazes and stacked 12 at a time into an outdoor ‘top hat’ kiln. 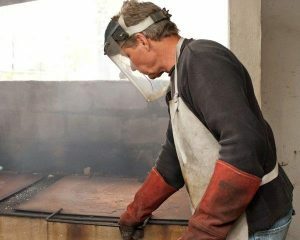 A gas flame burner is then steadily increased to heat the kiln to a temperature of 1000 degrees which melts the glaze. The Dlamini’s are then placed into a bed of sawdust and other combustibles. It’s in this burning wood smoke that the magic happens; altering oxides and crackling the glaze into random surface effects whilst turning unglazed areas black. This method of Raku, with its spontaneous and random patterned surface, creates an artistic element to each piece. The Dlamini is often given as a gift to that special someone or awarded to top achievers in companies. The Dlamini is truly a homegrown, handmade collectible art piece which has fondly gained a reputation as the South African Oscar. There is joy for the team in knowing that in almost every country across the globe there’s a Dlamini sitting proudly in someone’s home or office. Primitive pottery figurines from Africa date back to around 500 BC. The earliest of which were the Nok statuettes made of terracotta clay, combining strong formal elements with a complete disregard for precise anatomy. Their expressive quality is what inspired our now iconic ‘Collectable’, The Dlamini. CLICK ON THESE LINKS FOR..
SAA, Nedbank, Nashua, Drakensburg Boys Choir, PCB Chamber of commerce and The Midlands Literary Festival are a few of the organisations who have awarded bespoke Dlamini figurines to their top achievers or clients.. Follow The Dlamini on Facebook here. We appreciate all the media coverage The Dlamini continues to receive in print media and magazines. Should you wish to tell our story to your readers, please contact Trayci Tompkins on Email.